Supreme Air provides Air Conditioning, Heating and Plumbing Services, Repair, Installation, Maintenance, and Tune Up in Rockville, MD and surrounding areas. Service within 3 hours from placing the call. Tech was fast and thorough. Really knows his trade. Very well trained personnel and very clean. May be best o maintain in contact with the homeowner on arrival time. We had the 8-12 slot and personnel arrived after 1PM. Why is the humidifier not part of the service specially since it was installed by supreme air. Checked air filters, checked wiring and connection, checked for water leaks and flow, cleaned drains and traps. Rewired dehumidifiers and checked operation. Checked thermostat operations. On arrival set thermostat was calling for heat. An unusual noise was coming out of the blower motor, disconnected system to inspected it and found insulation stucked in the blower wheel. Took it off and unit is operating normal at this time. Customer paid $204.85, but we need to contact water furnace on Monday for part credit. Per Alex. On arrival checked thermostat was calling for cooling. Measure return temperature, supply temperature, amps, voltage, contactor, capacitor,filter is clean,blower wheel is clean, evaporator coil is clean, condenser coil is clean.unit is operating normal at this time. On arrival checked thermostat was calling for cooling. Measure water pressure coming in and going out, water temperature coming in and going out. Inspected electrical connections, voltage, amps, capacitor, contactor, evaporator coil is clean, and replace filter provided by customer(30x32x1). Unit is operating correctly at this time. I pressurized the ground loop to 65 psi. I set both flow rates correctly and checked heat of rejection. I cleaned the condensate drain pan# and drain lines and ran hot water to flush them out. I checked the electrical wiring and electrical systems, all are within specification. Both units are cooling with 20 degrees. Units are operating normal. I recommend adding an Intellistart Module to each unit to protect the compressor from shorted out windings by lowering the starting amperage by 50-60%. Intellistart is made by Water Furnace for Water Furnace. Customer wanted an estimate to talk over with there spouse. Customer has main panel box surge protectors, which is great. 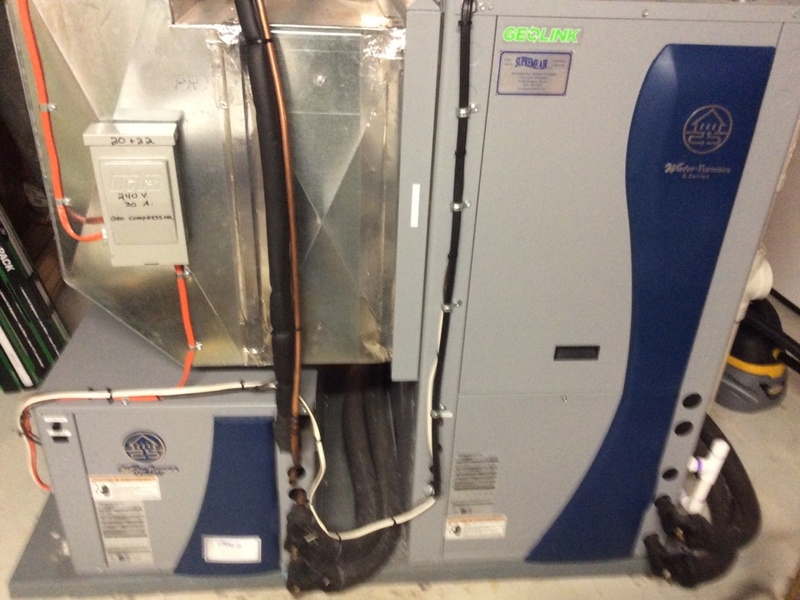 The upstairs units air handler had ultra violet lights installed but there are none on unit #1. I recommend adding a single Blue Tube UV light to this system and putting it in below the Trane E.A.C. I pressurized the ground loop to 65 psi. I went to switch loop pumps over from â€œwinterâ€ pump to â€œspringâ€ pump and the spring pump is broken. I tried purging air from it but it did not help, the pump is grinding and not pumping water. I left the winter pump in control and made an estimate to replace the left side pump and flush the ground loop. I made a part order form (estimate) for this. The filters had been replaced in December and were still in great shape. I checked the electrical wiring and electrical systems, all are within specification except the contactors are now showing pitting at the contact points and should be replaced. I made a quote for that as well. I cleaned the condensate drain pans and drain lines. Unit are operating normal and coolin* with 20+ degrees. On 03/13/19 installation surge protection also installed new disconnect box tested checked electrical connections checked voltage and amps system operating normal at this time. Also customer needs wi-fi thermostat i gave quote for customer he is going to call us when his ready. Upon arrival I went to condenser and verified solenoid was leaking at power head. This head can be removed so I used channel locks and was able to tighten head by a 1/4 turn, which stopped leak. Put gauges on system and ran heat. Found unit low in 410a because of previous leak. Added 2lbs of 410a to bring refrigerant up to spec. Ran defrost and let system satisfy. Unit operating normal at this time. Uploading video of solenoid showing that it is not leaking anymore. Replace faulty FP1 sensor . Checked operations. Upon arrival I Leak checked HeatPump. Found refrigerant leak coming from pinhole leak on discharge piping between filter drier and reversing valve. Cut out piping and replaced with new because pipe went underneath coil and would be too hard to cut out hole. Used nitrogen while brazing and sealed leak with new section of pipe. Pressurized and found no additional leaks. Vacuumed system and added factory charge of 8lbs 2oz. Ran heat and found suction pressure dropping very slowly and discharge pressure not moving at all. Tested defrost mode and found compressor is not pumping refrigerant and pulling 1/8th normal amperage. Compressor needs to be replaced, quoting customer. Customer left site before I could inform him of compressor. Office please follow up with customer. Installed LP kit for furnace. Once completed I checked for gas leaks, none found. Then returned power and ran heat on all stages. Adjusted gas pressure then checked heat rise and amp draw. Unit operating normal. Customer left before finishing. Upon arrival I was told that Trane HeatPump outdoor unit wasnâ€™t running. Only aux heat heating up space. During diagnostics I was shown condenser so I removed panels to find a good amount of oil underneath coil and filter drier. Put gauges on system and found no refrigerant, system flat. Quoting customer to leak search and repair but speculate coil is where leak is located. Customer would like us to see if coil is under warranty before we come out just in case. Also, while talking to customer about problem, I was approached but a gentleman from Rockville Crane who is interested in working with us. Office please follow up, he did not have a business card but I gave him mine. Fall pm on 02/27/19 On arrival set units to call for heat measured supply and return air temp measured voltage and amps inspected electrical connections checked drain and cleaned checked filters and replaced checked water pressure is good found attic GEO AHU disconnect box is malt need to be replaced also the whole house need surge protection I gave quote for customer customer accepted order the disconnect box and surge protection I connected the wires with wire nut for AHU. Tested the units units operating normal at this time we have to come back to finish the job. Also collected the full amount of the job $63.75 for Aprilaire air filter model #413 $241 for disconnect box $1052 for surge protection 1,052 total 1,356.75 customer have problems with water heater I gave quote for customer he will call us when his ready.